(1) You can click to enlarge the photos. I know that the first one is actually impossible to read unless you do so. After the first period, I tweeted that the Rampage had a remarkable ability to put their shots on net, while as Stockton couldn’t hit a barn. The Rampage ended up normalizing over the game (52% of Corsi attempts ended up being shots), however Stockton ended up having only 30% of their Corsi attempts end up as shots, which is the lowest for a team in a game since I started tracking near the end of last season. This team-wide inability to hit a barn is why the shots, even at 5 on 5 slanted heavily to the Rampage, despite the Heat leading in both Corsi close and Corsi overall. Anyone who read last year, will remember how much I hated the 3rd period shell that the Rampage used when leading (which cost them dearly in the playoffs). Something I loved is that this team does not. During the second period, while leading by between 2 and 4 goals, the Rampage registered 24 Corsi for while allowing 17 (58.5%). They started off the 3rd by allowing the first 9 Corsi events, however, from that point on, despite having a 4 or 5 goal lead, the Rampage led in Corsi 9-6! I nearly fainted when I realized that, what a difference, what a relief! It is especially refreshing, because my biggest problem with it last year was that the Rampage tried it with subpar goaltending. Think about it, if you have around a .900 save percentage like Rampage had for most of last season, if you allow just 10 shots in the 3rd period, on average you will give up that one goal lead. However, Calvin Pickard is really good. If you are going to sit back and play shell defense,it’s actually defensible when you have someone as good as Pickard. Having Pickard, and not playing a 3rd period shell makes me really excited. It’s one game (and it was never close), so draw any hard conclusions based on the Corsi for last night’s game. The Rampage had a negative Corsi for the game, but when you look at the individual numbers, it was primarily from the Martinsen, Hishon and Rendulic line. 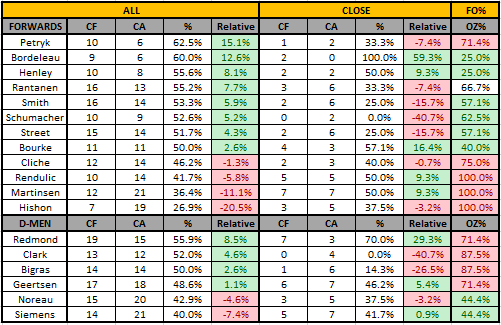 They were kinda of a disaster overall, but they are also a great example of why not to overreact to one game Corsi numbers, as they had one shift that was 6 Corsi against. Take out that one shift and they don’t look terrible. Despite being contractually obligated to love whoever has the best #FancyStats, Mikko is officially my favorite player. That Smith goal looked like something out of beer league, it was incredible. However, I believe a year in the AHL, which won’t burn off a year from his Entry Level Contract is the best thing for him and the Avalanche. There was one defensive shift where he started on the left point,3 seconds later was behind the goal line covering a puck handler and ended the shift on the right point. I don’t yet know the Colorado organization/Rampage defensive scheme, but I’m pretty confident that’s not it. That’s teachable though, and I can’t wait to see what he will be by the end of the season here, he has the potential to be really really special. October 26, 2015 in Analytics.